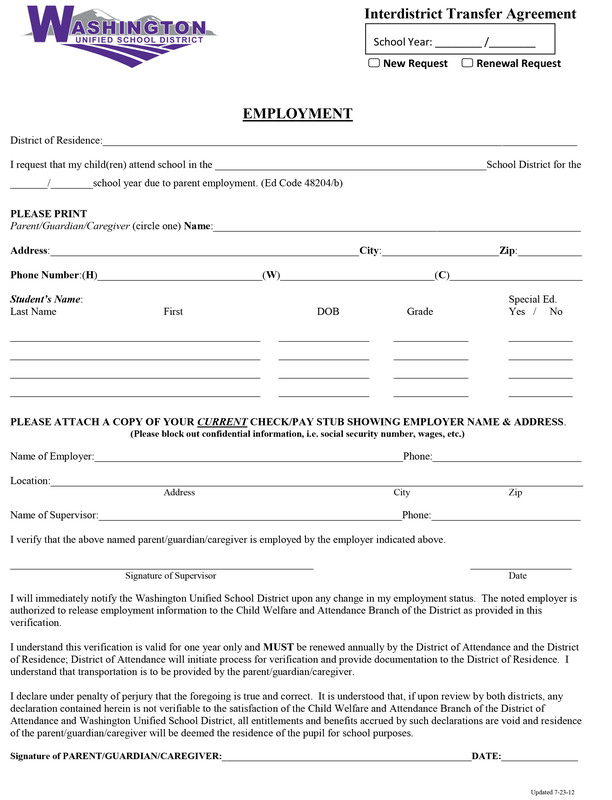 Inter-district transfer requests must be submitted to the student’s district of residence. For transfer requests received 15 or fewer calendar days before the start of instruction in the school year for which the transfer is sought, the district will notify parents of its final decision within 30 calendar days of receiving the request. For transfer requests received 16 or more calendar days before the start of instruction in the school year for which the transfer is sought, the district will notify parents of its final decision as soon as possible, but no later than 14 calendar days after the start of the instruction in that school year. 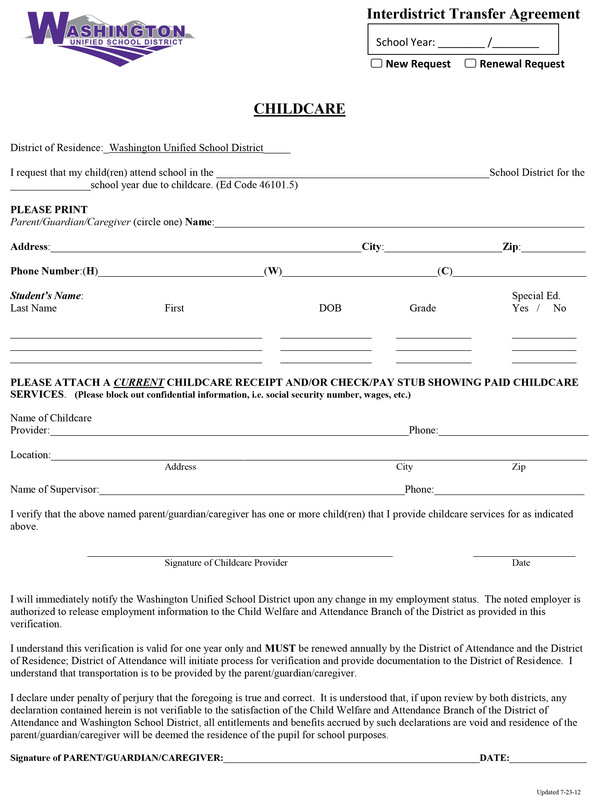 Washington Unified District Office will inform parent/guardian by mail if approved or denied. If no action is taken within 30 days, the parent/guardian has the right to appeal. If denied, appeals may be first made at Washington Unified School District (559) 495-5632. Appeals may also be made at the Fresno County Office of Superintendent of Schools (559) 265-3003. Appeals should be made within 30 days of the denial date or failure to issue an Inter-district Transfer Agreement decision. Children will not be enrolled at a requested school until Inter-district Agreements are approved by both districts and after it is determined that space is available in the requested grade, program, and/ or school. 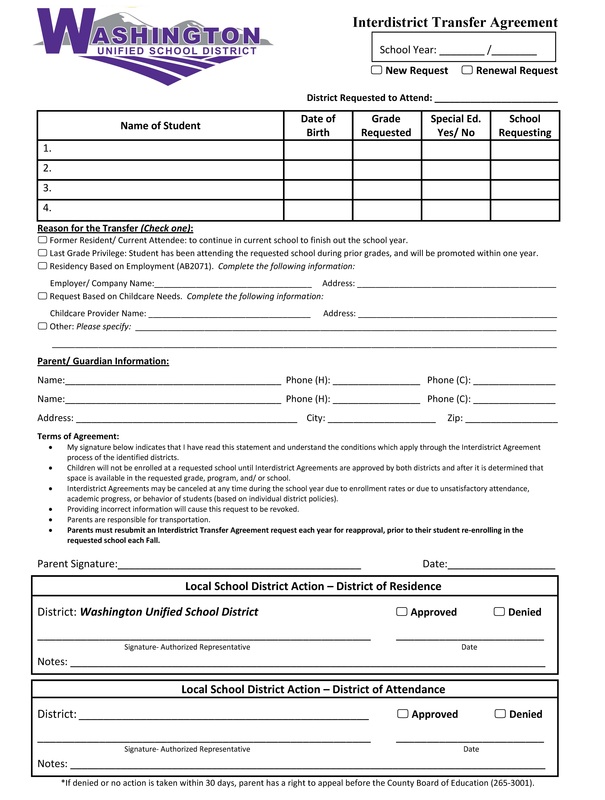 Students who have been approved to attend Washington Unified School District on an Inter-district Transfer Agreement must remain in good standing with academic effort, behavior, and attendance. Approval may be revoked and the student may need to return to his/her district of residence if a student is not in good standing. Inter-district Agreements may be canceled at any time during the school year due to enrollment rates or due to unsatisfactory attendance, academic progress, or behavior of students (based on individual district policies). re-approval, prior to their student re-enrolling in the requested school each Fall.